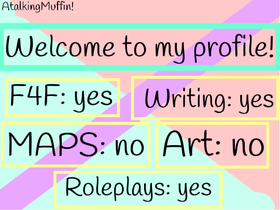 ~Call me Muffin! Or Muffy, for short! I am a self- acclaimed muffin. Don't judge. I love roleplaying! ~Thanks @ScratchTheDragon for profile pic! ~Two muffins were sitting in an oven. The other turned and shouted "AAHHH! A TALKING MUFFIN!"